This post is part of a compensated campaign with Cacique and Latina Bloggers Connect. All opinions and the recipe here are my own. Winter and family movie nights seem to go hand in hand, and you can’t have a movie night without a great snack! I love making up my own popcorn flavors, so this cheesy chile-spiced palomitas recipe is just what I want for a night in with the family and my Netflix account. When I got an air popper several years ago, I stopped buying microwave popcorn. The beauty of freshly popped popcorn made with an air popper is that you can make as little (or as much) as you want, and you can dress it up differently each time you make popcorn! And you’re not getting any chemical additives either, so you won’t feel unhealthy eating it. If you don’t have an air popper, you can also easily make the popcorn on the stovetop without any oil. I love to mix and match flavors all the time, but one of my favorite combinations is melted butter, chile powder, queso cotija and a little squeeze of fresh lime juice. Sometimes, I substitute the chile powder for a liquid hot sauce such as salsa Búfalo or Tapatío. If I’m feeling like something really spicy, I might even use a habanero salsa! 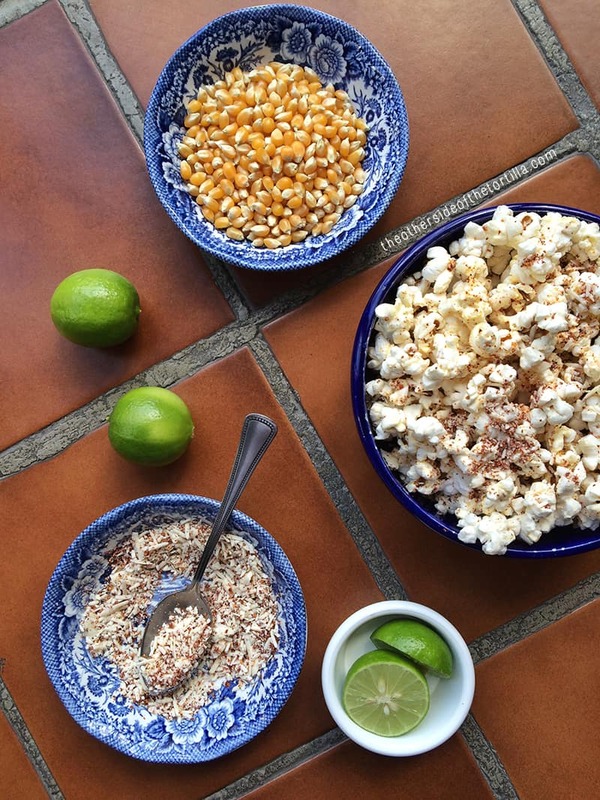 Popcorn (also known as palomitas) is also an awesome street food treat in Mexico, so I love recreating street palomitas at home. The wonderful thing about this recipe is that since the queso cotija is already salty, you really don’t need to add any extra salt. If you do like your popcorn pretty salty, though, I recommend swapping the unsalted butter for salted before you go sprinkling any more salt on the popcorn. 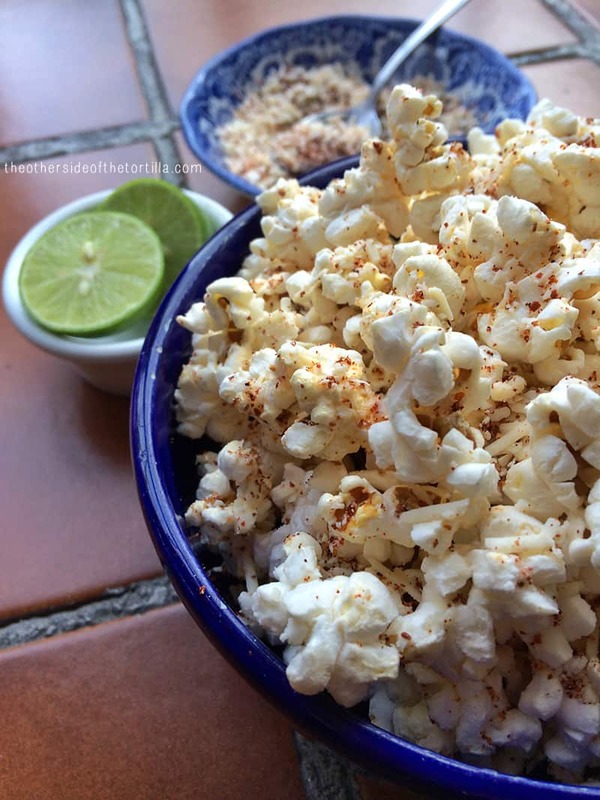 I love to munch on these spicy and tangy palomitas while watching all kinds of different movies, from classic cine mexicano to 80s movies to animated flicks with the younger members of my family. I can’t wait for “The Book of Life” to come out on DVD so we can watch it with our whole family in February! If you loved the movie just as much as I did, you can enter Cacique’s Dinner and a Movie Sweepstakes for your chance to win a VIP movie experience in Los Angeles, with a behind-the-scenes tour and private screening of “The Book of Life”! Enter the sweepstakes at caciqueinc.com/bookoflife. Turn a street food favorite into a family movie night snack! 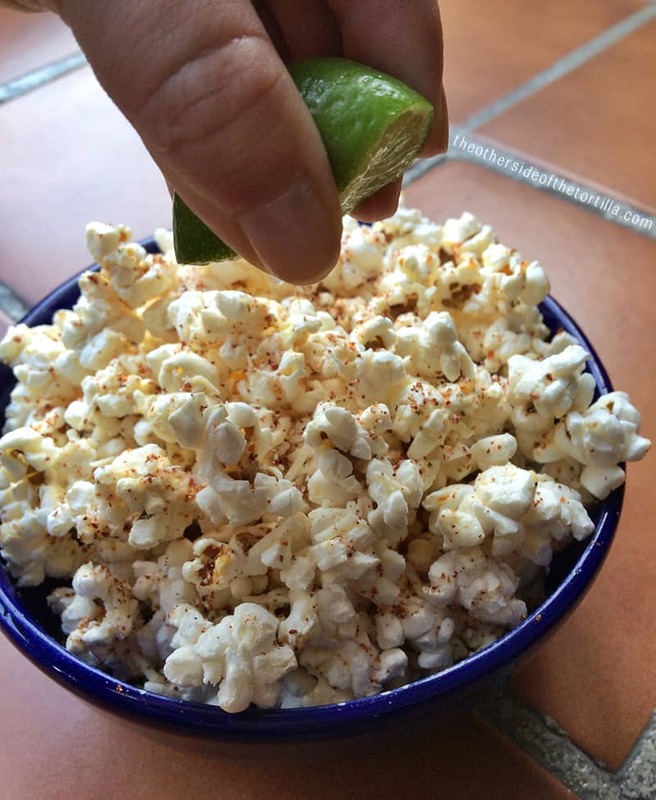 Make your popcorn spicy and tangy with grated queso cotija, chile powder, melted butter and a little squeeze of lime juice! Grate 1/4 cup Cacique queso cotija with a medium-grain cheese grater. Combine Cacique queso cotija and chile quebrado or chile powder in a small dish. Melt butter in a microwave-safe dish at 15-second intervals, then pour over popcorn in the large bowl. Sprinkle the mixture of Cacique queso cotija and chile powder over the buttered popcorn and toss well, using a large spoon. Optional: To add a bright, citrusy flavor, squeeze 1-2 key limes over the top of the dressed popcorn and toss to incorporate. If you can't find key limes (the tiny kind), you can substitute with the juice of 1/4 of a large lime. If you do not have an air popper, you can make the popcorn on the stovetop without any oil. You'll need a deep pot with a lid. Pour the popcorn kernels in the bottom of the pot and heat over medium heat, gently shaking the pot every 30 seconds until the popcorn begins to pop. It will take around 4-5 minutes before the popcorn starts popping. Once it does, gently shake at 10 second intervals until the popping slows down. Remove from heat, shake a little bit more, then allow to sit for about 1 minute before you remove the lid. Most of the popcorn should be popped, with very few kernels left.